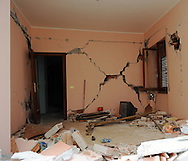 Since the day an earthquake hit the city of L'Aquila, in central Italy, the area has been shut. No living, social or commercial activity has been permitted within the so-called "red zone", a large area which embraces most of the historical centre. Outside, army vehicles halt anyone trying to enter. Inside, it is a ghost town inhabited by its own phantoms. The feeling of a lifeless place is dreadfully intense. Hundreds of people died in the quake, many thousands had to leave their apartments for good. 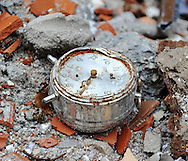 This reportage jumps over the barriers and take the reader in the heart of the earthquake. It walks the streets, enters the halls, visits the homes to take a look into the rooms. Where time froze. It gives back to the owners the places they have been bereaved. It gives back to the places the life they lack.